The Great Red Horse: A Colt is Born is an illustrated children’s book on the life of the famous Morgan horse, UC Ringmaster. The University of Connecticut, “UConn,” nestled deep in the emerald-green hills of Storrs, started its Morgan horse breeding program in 1931. In 1978, a deep-red colt with a white star on his face was born and his name was UC Ringmaster—a future two-time English Pleasure World Champion. The “UC” stands for UConn—and all Morgan horses born and bred at UConn bear those two letters before their names. UC Ringmaster was UConn’s most famous horse, known for his beauty, his talent and his charming personality. UC Ringmaster began a brilliant journey the moment he landed in the soft straw in his mother’s stall. The Great Red Horse: A Colt is Born tells the early story of Ringmaster’s life—his first steps, his first friends, and his first joys. In The Great Red Horse: A Colt is Born, a young Ringmaster invites us to remember what is important in our lives: the sun warming our faces, happy times with those we love, and the wind ruffling the tall grass as we race through a meadow bursting with wildflowers. 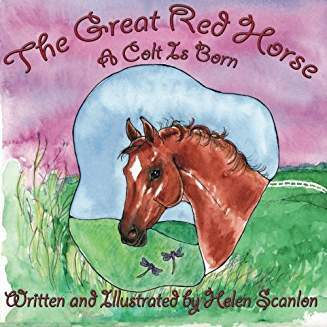 The Great Red Horse: A Colt is Born is the first of three fully-illustrated children’s books chronicling the life of this amazing horse.